Anyone in tech can tell you that Actual Teens are hallowed ground. Where teens’ tastes wander, the industry froths itself into a frenzy attempting to follow. For teens are a bellwether of dollar valuations to come. So what are American teens keen on right now? A new report by the Pew Research Center delves into the tech that matters to the kids that matter. First startling stat: access to mobile devices is enabling a nearly quarter (24%) of teens to be online “almost constantly”. Which does rather underline why Actual Teens are so beloved by the tech industry. These eyeballs are oh-so-hungry for content to consume. Smartphone penetration (either ownership or access to a device) stands at a not-so-surprising three-quarters (73%) of teens, according to Pew. A further 30% of teens have access to a basic mobile. Almost all (92%) the polled teens profess to go online daily. A majority (56%) are online several times per day. While those youngsters not getting a daily tech fix are a vanishingly tiny minority: just six per cent of teens report going online only weekly. And but 12% limit their digital activity to a once per day fix. As you’d expect, access to mobile devices drives increased teen time online, with the vast majority (94%) of teens who access the Internet on a mobile going online daily or more often. Interestingly the research highlights some differences across different racial and ethnic groups, with African-American and Hispanic teens most likely to report being “online constantly” (34% and 32% respectively), vs 19% of white teens. But again the big driver for being most online looks to be smartphone tech — with African-American teens most likely (85%) to have or have access to a smartphone, ergo they are also more likely to be constantly online. That said, Hispanic teens and white teens are equally likely (71%) to be able to access a smartphone — despite Hispanic teens being more likely than white teens to report being online constantly. “American teens, especially African-American youth, have embraced smartphones and the 24/7 access to people and information that they offer,” notes Amanda Lenhart, associate director for Research at the Pew Research Center and the report’s lead author, in a statement. So what social media services are America’s Actual Teens obsessing about? 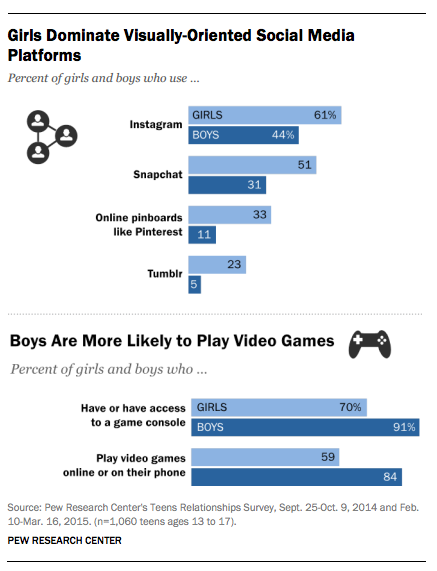 Facebook first and foremost — which remains the dominant social network for U.S. kids. A majority (71%) of these 13- to 17-year-olds report using Facebook. Next most popular is Facebook-owned photo-sharing service Instagram, used by 52% of teens. Then it’s Snapchat (41%); Twitter (33%) and Google+ (33%); Twitter -owned Vine (24%); and Tumblr (14%). Pew notes that teens are diversifying their social network site use, with a majority (71%) reporting using more than one social network site out of the seven platform options they were asked about. Among the fifth (22%) of teens who only use one site, most (66%) use Facebook as their sole social fix, while 13% use Google+, 13% use Instagram and 3% use Snapchat . Facebook also came out on top as the platform teens use most often, with 41% of teens identifying it as their most frequently used social service, followed by Instagram (20%), and Snapchat (11%). Meanwhile older teens skew in favor of Facebook, Snapchat and Twitter as their most used platform, vs younger teens being a little more focused on Instagram. Socio-economic status also influences choice of social media, with the survey finding that wealthier teens, whose families are in middle and upper income brackets, lean a little more towards using Snapchat than those from families in lower income brackets. Twitter also skews to wealthier socio-economic backgrounds teens. Conversely, teens from less well-off households are more likely to say they use Facebook the most. Pew also investigated teens’ messaging app use. A third (33%) of teens with access to smartphones report having messaging apps such as Kik and WhatsApp — which sounds low when compared to the 90% who report exchanging texts (i.e. cellular SMS). On the messaging app front, the researchers again found some differences among teens of different races and ethnicities. According to the report, African-American and Hispanic youth are substantially more likely to use messaging apps than white teens, with 47% of African-American teens and 46% of Hispanic using a messaging app vs just a quarter (24%) of white teens. The report is the first in a series of forthcoming Pew reports examining American 13- to 17-year-olds use of tech. It’s not the first time the research firm has scrutinized this demographic either, although it notes it has changed its methodology for the latest report — using an online only survey method vs telephone interviews it has used in prior teen polls — so is not making like-for-like comparisons with earlier reports. The latest survey polled a nationally representative sample of 1,060 teens over two periods, one last fall, and again in spring.